A new study by Mónica Hernández examines the effects of the post-Katrina school reforms on the expulsion and out-of-school suspension rates of New Orleans' publicly funded schools. Over the last decade, there has been much debate about whether and how schools should use discipline practices that remove or exclude students from class. These exclusionary practices, most notably expulsions and out-of-school suspensions, are correlated with numerous negative student outcomes including increased likelihood for contact with the juvenile justice system, especially among low-income students and students of color. There are also concerns that the use of exclusionary discipline may be more prevalent under market-based school reforms. Some charter schools adopt strict approaches to discipline, and market accountability may encourage schools to use expulsions or suspensions to push out certain students. 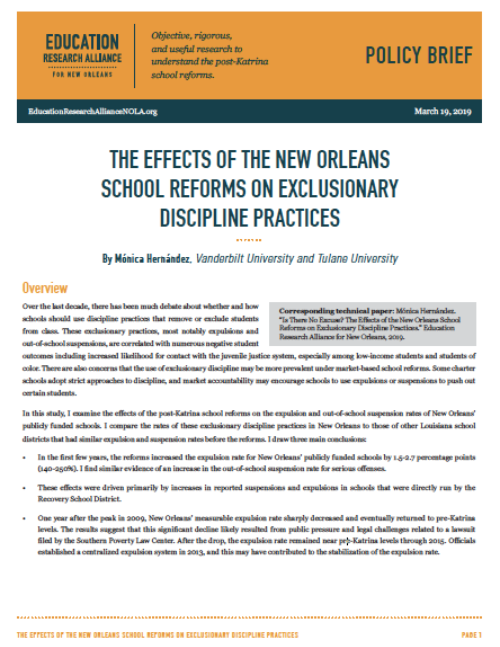 In the first few years, the reforms increased the expulsion rate for New Orleans’ publicly funded schools by 1.5-2.7 percentage points (140-250%). The author finds similar evidence of an increase in the out-of-school suspension rate for serious offenses. These effects were driven primarily by increases in reported suspensions and expulsions in schools that were directly run by the Recovery School District. One year after the peak in 2009, New Orleans’ measurable expulsion rate sharply decreased and eventually returned to pre-Katrina levels. The results suggest that this significant decline likely resulted from public pressure and legal challenges related to a lawsuit filed by the Southern Poverty Law Center. After the drop, the expulsion rate remained near pre-Katrina levels through 2015. Officials established a centralized expulsion system in 2013, and this may have contributed to the stabilization of the expulsion rate. These results are broadly consistent with media reports that highlighted seemingly harsh punishments in the early years, a concern that has dissipated over time. However, conversations with local educators suggest that schools reported suspensions and expulsions inconsistently, which would affect the data and findings. Regardless of how discipline shows up in the data, there can be little doubt that discipline practices play a critical role in shaping the schooling environment and students’ opportunities to learn and that more accurate data are needed to understand this important topic.